Indulge in your favorite ice cream, homemade with your chosen ingredients yet with the smooth, even consistency of commercial brands. Knox Gear brings you the best of both worlds with this Automatic Electronic Ice Cream Maker. Why choose Knox Gear over traditional ice cream makers? • Commercial-style compressor allows you to prepare batch after batch without waiting. • No need to pre-freeze before making ice cream. Whip up your favorite frozen treat as soon as the craving hits! • Customize the consistency of your frozen treat. Whether you like your ice cream custard-style or hard, Knox Gear's ice cream machine whips up a perfect batch. • Built-in timer gives you the freedom to do other things while your ice cream is being made. • Extended Cooling Function cools your ice cream and prevents it from melting even if you don't store in the freezer immediately after it has been made. The cooling function will automatically turn on 10 minutes after mixing has stopped and run for 10 minutes. It then automatically shuts off again and repeat the cycle for one hour after the ice cream making process has finished. • LCD Display shows you the remaining time in the center of the screen and temperature in the top right corner. Two user-friendly icons indicate mode. Both the Freezing icon (a snowflake) and the Mixing icon (a blade) will display when the machine is running. The Freezing icon alone (snowflake) means the automatic cooling function is being performed. Kno Gear creates innovative products that the whole family will love without breaking the bank. Enhance the comfort of home life and facilitate everyday routines with products that Fortify the EverydayTM. We are you sure you will love our products, and stand firmly behind them with a 1 year warranty. QUICK, ONE TOUCH CONTROL: It couldn't be easier or quicker to make homemade ice cream. Simply pour in the ingredients, turn it on, and it is ready in less than 60 minutes. The large 1.5qt capacity bowl holds more than 12 cups of ice cream. 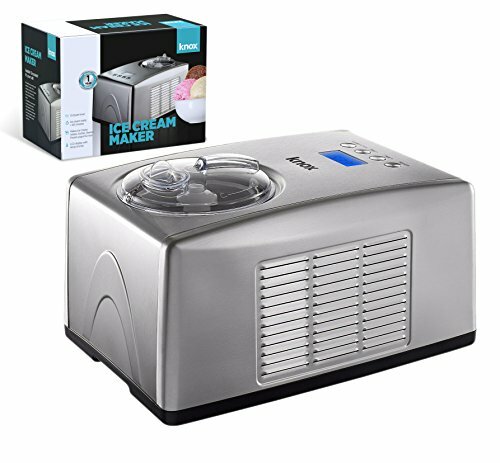 NO PRE-FREEZING NECESSARY: With the built-in commercial quality compressor this is better than other ice cream makers which require you to freeze the mixing bowl in advance. Make froyo or dessert on a whim - no preparation necessary! SLEEK STAINLESS STEEL: This stunning appliance fits right in to your modern kitchen & lifestyle. With its elegant stainless steel body and LCD display, you'll be proud to show it off. It makes the perfect wedding gift or housewarming present.